® Viet Linh giữ bản quyền. Use industrial feed in the form of pellets produced domestically or imported for shrimp farming. Feed quality has to be ensured a total protein content of 32-45%. Ingredients in feed and feed supplements must be in the approved list to be used in Vietnam with complete labels according to policies. Feed should be stored according to directions on the label. Do not use expired feed. In addition, depending on the actual situations (shrimp health, molting cycle, weather, etc.) and observation of the amount of feed eaten when shrimps are at 20 days of age or older to adjust the feed. Avoid feed shortage or surplus, which will affect the growth and health of the shrimp. Timing and the amount of feed each day for shrimp is in Table 5. - On the 10th day after stocking, put feed in feeding trays for shrimp to get familiar, also for farmers to check the amount of leftovers easily later. Put feeding trays in flat places, 1.5- 2m far from the pond, behind the paddlewheel aerators 12 - 15m. Do not place trays in the corners of the ponds. Place 1 tray each 1600-2000 m2. - After 15 days, supplements providing vitamins and minerals can be used according to the suppliers' instructions to help improve shrimp health. - Black tiger prawn: From days 1-3, feed with the amount of 1.2 - 1.5kg/100,000 postlarval shrimp. From days 4-10, increase 200gr/100,000 postlarvae each day. From days 11-20, each day increase 250gr/100,000 postlarvae. From day 20 until harvest, increase 300gr/100,000 postlarvae. By the day 31 until later, adjust the amount of feed appropriately by checking feeding trays. - Whiteleg shrimp: On the first day, use feed with the amount of 2 kg/100,000 postlarvae. In the first 20 days, increase 0.2 kg/100,000 postlarvae each day. From day 21, increase 0.5 kg/100,000 postlarvae each day. + Adjust daily feed by observing the amount of excessive feed in trays. Supplementary products such as enzyme (T-Food, Sitto SC...), minerals (TAFeedMin...), and vitamin C can be added on to the feed. + Change types of feeds appropriately based on shrimp development stages, mouth sizes, and nutritional needs according to the manufacturers' instructions. When changing feed, mix two kinds of old and new feed for at least 3 days before using the new feed completely. 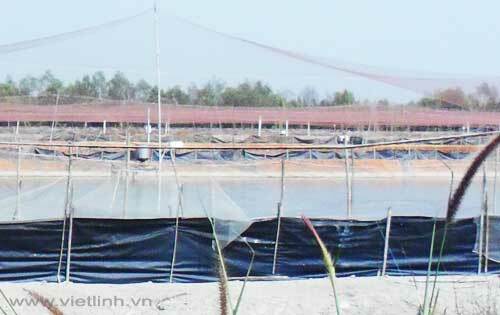 Source: Temporary process for safe brackish-water shrimp farming in areas affected by diseases in Vietnam. According to The Official Dispatch No. 10/TCTS-NTTS. January 6th, 2015. Vietnamese Directorate of Fisheries. Viet Linh 2015. Translated by Sonia Linh V.
Shrimp farming experience: Disease prevention or treatment? © Copyright 2000 ® Viet Linh - All rights reversed. ® Viet Linh - All rights reversed.